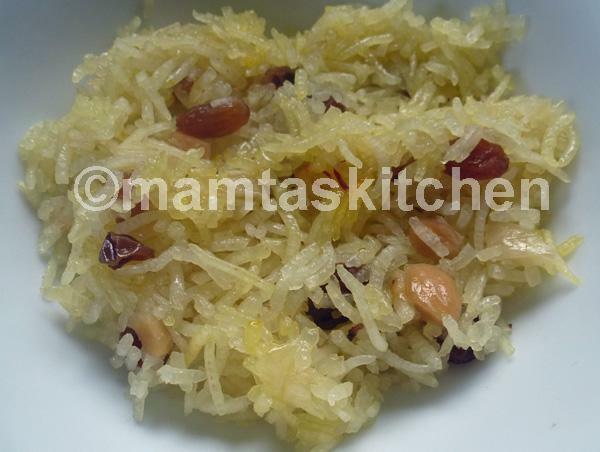 Sweet rice is often made on special occasions in India. In Northern India, it is one of the first dishes offered to a bride, when she enters her husband’s home for the first time after the wedding. First her husband and then each close member of his family feeds her a spoonful of sweet rice. This is to welcome her into their family. Serves 8-10 as a dessert. This is my mum's old recipe-Mamta. Measure all ingredients & keep aside. Soak almonds in hot water for 1/2 hour, remove skins & slice finely or thickly, as you like. You can use pre-shredded almonds. Peel cardamoms, only seeds are used in this recipe. Wash and drain sultanas, if dusty. Keep aside. Partly boil rice until only two grains are felt when rice is squashed between thumb and fore-finger. Drain off the water in a colander (chalni). Rice grains should be separate. don't leave it any more raw than this. Once you add the syrup, the rice cooks very slowly, so you don't want it to be too raw before adding syrup. Make syrup by boiling sugar and water together, until it is of 'one wire' consistency (when a drop of syrup is pulled between the thumb and forefinger, a single wire is formed). Keep aside. Heat ghee in a pan and add cardamom seeds, cook until they splutter, 10 seconds or so. Add the syrup and rice, almonds and sultanas, mix well, cook on low heat, with a tight fitting lid, for 10-15 minutes, until rice is cooked through and all syrup is absorbed. If you have an oven, transfer rice mix into an oven proof dish. Cover and cook for 10 minutes at 200 C.
Serve hot, after a meal. People often eat piping hot plain, boiled rice, mixed with sugar and butter/ghee, after a meal. Rice must be hot and the sugar unrefined (boora) or brown, for best flavour. Different dry fruits and nuts can be used according to availability. BBQ Sweet Rice: Cook rice as above. Make small parcels, one parcel per person, wrapped in aluminium foil. Towards the end of the BBQ, place the parcels on the BBQ for a few minutes to heat. Serve straight from the BBQ.